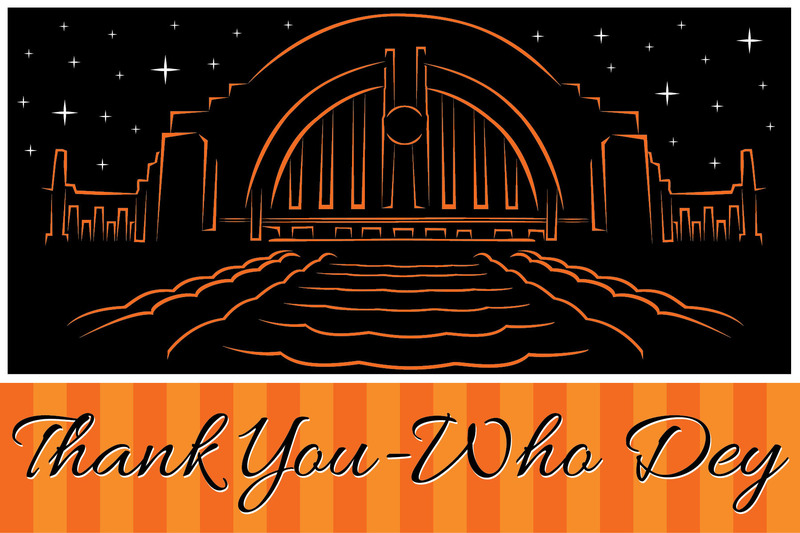 When I posted the Thank You card for Los Angeles a couple of weeks ago, someone requested that I create one for Cincinnati. For a few minutes, I couldn’t figure out which icon would best represent the City of Cincinnati. The city has three bridges that connect it to Northern Kentucky, and I had already designed a card with a bridge, The Brooklyn Bridge for New York. I really didn’t want to create another card with a bridge as the icon in it. After looking at several photos, I chose to use Union Terminal located on the westside of the Queen City. The architecture is amazing inside and out, and there are so many cool things to see and do there. Last year, Union Terminal hosted the Dead Sea Scrolls and I just had to go. I’m so glad that I went because it was an amazing experience I will probably never see again in my lifetime. The exhibit was beautiful and full of historic facts. Since Cincinnatians are HUGE Bengals fans, I had to use orange in my card. And the statement after Thank You – Who Dey is a Cincinnati saying native to locals. So, this card is especially designed for my friend, Gina.